While diving in Kahului Harbor, Maui, in October 2009, Pauline Fiene found this small star under rubble at a depth of about 10 ft. Cory Pittman photographed it then sent the photos to expert Chris Mah at the Smithsonian, who kindly identified the animal. Although this specimen was only a bit more than an inch across, Chris says that the species varies greatly in size can grow to about 8 inches and has 7 to 12 rays. It frequently reproduces by fission (i.e. dividing in two through the disc) and some of the arms are typically shorter than others. Although no recent photographs of Hawaiian specimens are known, museum records show that the species has been found on Oahu in Kaneohe Bay and Honolulu (Harbor? ), and on Maui in Kahului Harbor and Maalaea Bay. (Maui specimens are consistently smaller.) It differs from other shallow water stars in Hawaii by having four rows of tube feet. The species is widespread in the Indo-Pacific. 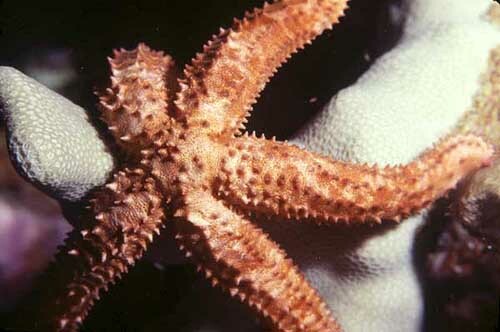 Check out Chris Mah's Echinoblog page for this species. In Hawai`i, this star is most common well beyond sport-diving depths, but Gordon Hendler recently found this one in a Halimeda bed at a depth of 30 ft. off West Maui. Cory Pittman snapped the photo. The star was about 2 in. across. I sent the photo to sea star expert Chris Mah, who said it is 90% sure to be Astropecten polyacanthus, although he couldn't be absolutely positive without examining the specimen. Pauline Fiene also reports seeing one of these in Ma`alaea Bay, Maui. Stars of this family all live in soft substrate. They could be more common at scuba depths than we think because they don't live on reefs, where divers and snorkelers do most of their looking. The species has a wide Indo-Pacific distribution and has been found as shallow as 3 ft in other parts of the world. 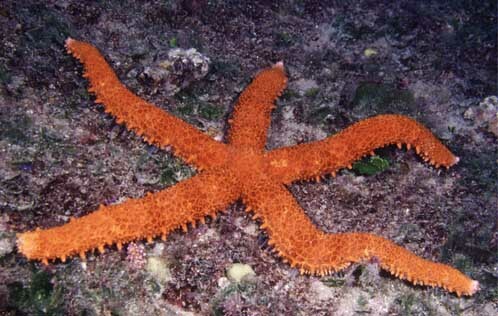 This star is quite similar in appearance and habits to the 10-armed Magnificent Sea Star (Luidia magnifica) described in my book. It is smaller, however, and has only 8 arms. The specimen pictured here was collected by Norton Chan at the Lanai Lookout, O`ahu, and photographed at the Waikiki Aquarium. I added this photo to the Revised Edition of Hawaii's Sea Creatures. In my book I have a photo of a much smaller specimen of Mithrodia fisheri and state that the species is most active at night and usually found in caves. I also state that individuals are typically 4-6 in. across, but note that Edmonsdon records specimens up to 20 in. across. When I wrote the book I had never seen a large Mithrodia in Hawai`i and was a bit skeptical of Edmondson's record. Well, I was wrong. Off Makua, O`ahu, at about 80 ft., I've seen large specimens at least 12 in. across, and possibly larger. I also saw one once off Barge Harbor, Lana`i. Unlike their smaller brethren, these big guys are out and about in the middle of the day. It's possible that two separate species are involved, but it seems equally likely that smaller ones in shallow water tend to be nocturnal while larger ones in deeper, dimmer water don't mind coming out by day. Just for the record, below is a photo of a tiny juvenile taken in shallow water off Kahe Point, O`ahu. It was under a coral slab. I added this photo to the Revised Edition of Hawaii's Sea Creatures. 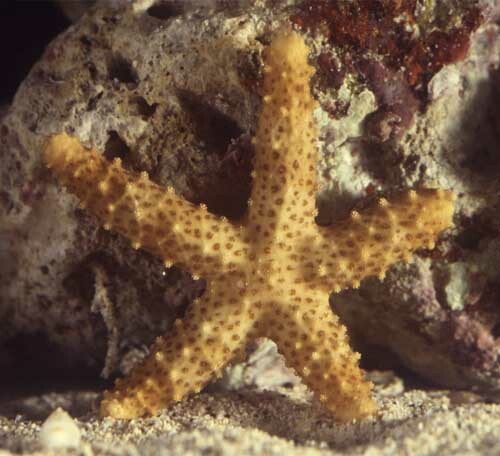 I saw this star on a night dive in Hanauma Bay, O`ahu, in the Finger Coral beds at about 50 ft. I couldn't photograph it where it was under the coral, so I placed it on the coral for a clearer view. I have never seen another. 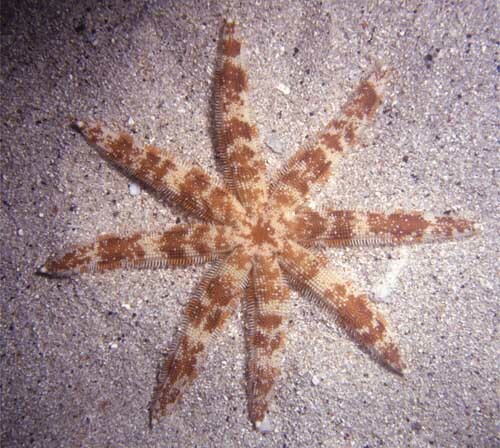 After quite a bit of work, Chris Mah identified it from the photo as Sclerasterias euplecta. I know nothing more about the animal. Perhaps its center of population lies deeper than most scuba divers care to go. I have added this photo to the revised edition of Hawaii's Sea Creatures.